Die Trainingsleiter ist ein Element und besitzt ein Tragenetz. Für Beinarbeitdrills. Größe: 0.40m x 9.10m mit 10 zwischenbereichen. Sprossenbreite 40cm. Das Bild dient der Veranschaulichung. Abweichungen sind möglich. 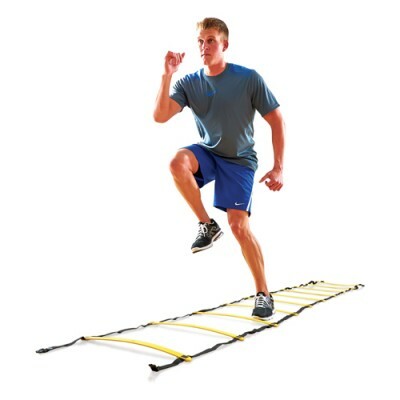 The Fixed Rung Agility Ladder can be of assistance when your players are looking to improve their accuracy and foot speed. Durable 1" W webbing with end buckles and slats allow for various configurations in order to maximize workouts through diversification. 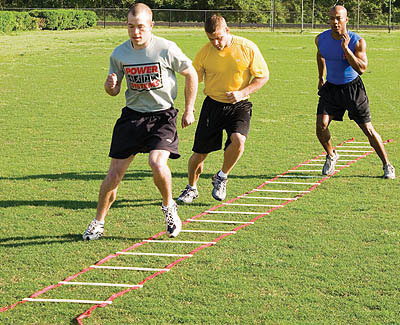 Additional ladders can be added for longer runs and various formations. Each rung is fixed in its positioning. Measures 15' L X 20" W with ten sections. The Fixed Rung Agility Ladder is definitely a winner; and comes with a carrying bag for easy transport. Weiterführende Links zu "Speed Ladder"
PHILADELPHIA EAGLES CRYSTAL FREEZER MUG 16-OZ.